Can You Cure Acne with Diet? I‘ve always believed that beautiful skin comes from two places, first heredity and second diet. So what if you’re prone to acne or dry skin? Can diet really make a difference? Vitamins – including E, A, K, and B complex – are extremely important for skin care because of the role they play in everyday bodily functions like stimulating the immune system and helping your body to build news cells and body tissues. Many of these vitamins work as powerful antioxidants that help your skin deal with the stresses from wind and sun damage. They are also responsible for warding off potential bacterial or fungal infections that may cause acne. Great sources of these vitamins include grapefruit juice, carrot juice, spinach, and sweet potatoes. But what about vitamin supplements? Supplements might seem like the easy way to boost nutrition, but the body doesn’t always absorb vitamins and minerals from pills the same way it does from natural food sources. In recent years, there have been many documented cases where supplements have been tainted with very hazardous additives such as lead and this continues to be a problem since they are not regulated by the FDA. Toxicity is another concern if you are taking too many supplements or too high of a dose of certain vitamins like A and E that can cause liver damage and other problems when consumed in high amounts. So how can you ensure you’re getting the right amount? Nature has already provided us with the best and safest way to get these vital nutrients – through a variety of fresh organic vegetables and fruits. So start with 7 to 9 servings a day, around 3 cups of vegetables and 2 – 3 cups of fruit. If you don’t have time to cook, eating your veggies raw or juicing is another great way to get an extra dose each day. 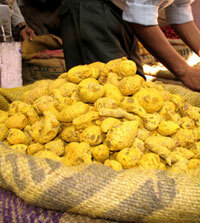 Turmeric, which I consider to be the “super star” spice of Yogic and Ayurvedic health, has many healing properties. It works as an anti-inflammatory and yogis, who take to bathing with it, swear by its unique medicinal properties. Turmeric is currently being studied in the fight against cancer and is now also being used as a medicine to fight psoriasis. Cooking with tumeric is easy and the ground version can be purchased in your local grocery store. Many other plants also have healing properties that have been scientifically proven. Tea tree oil, for example, has been used for centuries as a holistic cure in Australia and studies have shown that it has potent anti-fungal properties that make it a popular and effective ingredient in skin care. Many other herbs, such as thyme, rosemary, and basil also have anti-septic qualities and can be chopped up and added for a soothing hot bath or regularly enjoyed in healthy home cooked meals. Keeping you body properly hydrated will increase the water content in your skin. Water is also necessary to help your body flush out impuritites after meals that could end up affecting the quality of your skin. Most medical professionals advise drinking 8 to 10 glasses of water throughout the day, while others say that you should simply drink water when you’re thirsty. In my own personal experience, sipping hot water and having large glasses of water in between meals and throughout the day has made real improvements in the way my own skin looks and feels. If you dread the idea of drinking “plain” water, try a sprig of fresh mint or a squeeze of fresh lemon (or lime) to flavor your water without adding harmful preservatives. Find out more tips from Joy Bauer on how to eat your way to healthy skin. Find out where turmeric comes from. Learn more about the amazing health properties of vegetables and fruits. Can skin creams make your skin drier?